Following is a list of tips, tools, and training resources from Cadalyst. Shortcuts, reminders, and customization code (LISP and VBA) -- primarily for AutoCAD but you'll find a few other software solutions covered from time to time too. Check out these quick but powerful AutoCAD tips from Cadalyst and Autodesk technical evangelist Lynn Allen. 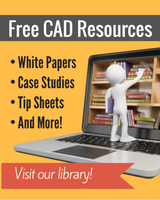 A new batch of CAD tips every week, plus practical resources, deals and freebies, new books and training updates, CAD events, and more for the CAD manager and user. View the archives or subscribe and we'll deliver a free copy to you inbox every Monday. Cadalyst offers an extensive lineup of CAD software tutorials you won't find anywhere else -- for AutoCAD, Civil 3D, Revit, MicroStation, ArchiCAD, Inventor, SolidWorks, Solid Edge, Alibre Design, and more. Connect with other CAD users and Cadalyst readers at Cadalyst's Facebook page and LinkedIn group. Get updates on the world of CAD by following Cadalyst on Twitter. A variety of articles covering all aspects of CAD training, including practical resources and advice for CAD managers and users. Search by location or keyword and locate the latest CAD-related job opportunities. Test and compare your workstations' performance running AutoCAD. Can't find what you need? Want to submit an article suggestion? Contact us at editors@cadalyst.com.